Weather-related airport delays notwithstanding, winter is a great time to travel. Plenty of destinations in the U.S. and around the world experience their shoulder-season or low-season in winter, and the corresponding lower prices make it more affordable to visit some normally pricey destinations. Of course, weather varies from mild to downright cold in winter, but the big savings may make up for it. This year’s top five picks include San Diego, London, Washington, D.C., Santa Fe, and Israel. Southern California is always a favorite spot for winter vacations. While temperatures may be too chilly to sunbathe on the beach for all but the most devoted beach bums, sunny skies and temperatures in the 50s and 60s are ideal for sightseeing outdoors. San Diego offers some great events in winter, along with cheaper hotel rates than you’d find in summer. Restaurant Week comes back to San Diego January 11 through 16, with more than 150 participating restaurants. Prix-fixe dinners go for $20, $30, or $40 per person, depending on the restaurant. Advance reservations are recommended, so plan ahead if you plan to try out one of the included restaurants. February once again brings Museum Month to San Diego. Throughout the month, more than 30 museums around San Diego offer half-price admission to Museum Month pass holders (passes are available for free at Macy’s stores around the county). Note that while the Museum Month website still reflects 2008 details, it will be updated for 2009. If you’re not visiting in February, you can still save on museums and other attractions by purchasing discount passes. The Passport to Balboa Park costs $39 (valued at $85) and includes admission to 13 park museums, and a Zoo/Passport Combo pass costs $65, a $130 value. Beyond the park, the $89 San Diego Passport to Adventure includes an Old Town Trolley Tour, zoo admission, a harbor cruise, several museum admissions, two-for-one dining discounts, and more. The ever-popular Go Card and CityPass are available for San Diego as well. San Diego hotel rates and prices for airfare are less expensive in winter than at any other time of year. When I compared summertime vacation packages to winter airfare-and-hotel bundles, I found off-peak savings of up to $201. Prices are per person based on double occupancy and most include taxes and fees. 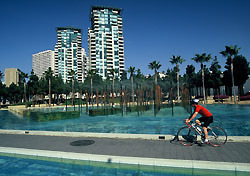 The San Diego convention and visitors bureau offers a wealth of information about San Diego accommodations, events, and more. Our San Diego Vacation Guide is also a good resource for money-saving tips.